Why does everything have to be about race with some people? Americans don’t really care how you protest, but they do care when you protest, and during the national anthem, a sacred moment, would be one of the very few times any America-loving patriot would object. Stand on your head at midfield during halftime if you like, but during the national anthem, all present should be standing and facing the flag. That’s all. 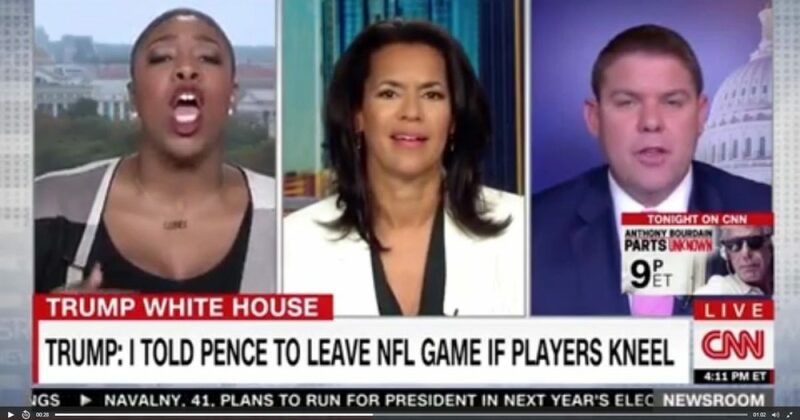 Things got pretty heated on Sunday when CNN contributors Symone Sanders and Ben Ferguson locked horns over Vice President Mike Pence’s decision to walk out of an NFL game after several players kneeled during the national anthem, reports IJR. On a lighter note, the look on host Fredricka Whitfield’s face during the exchange, as she tried several times to throw a towel into ring, was priceless. The former Indiana governor attended the game in Indianapolis between the hometown Colts and the San Francisco 49ers to honor former Colts quarterback Peyton Manning, whose number 18 jersey was retired during a halftime ceremony. For those keeping score at home, former quarterback Peyton Manning’s team beat former quarterback Colin Kaepernick’s team, 26-23.